“This production was by far the most original and far-reaching I have seen in some two decades, and the capacity of Still Lives to change minds – about the nature of theatre, the nature of community, and human nature – cannot be underestimated.” Audience response from Society for Disability Studies Conference, San Jose, California. The Earthquake in Chile is a Free Theatre production in collaboration with international performer/director Richard Gough (Centre for Performance Research, Wales), New Zealand celebrity chef Richard Till and A Different Light Theatre Company. It is performed as part of the 2011 Body Festival. This is the story of The Poor Dears. Follow their madcap adventures as they struggle to survive in a country where funding is cut to Adult and Community Education and to those with high needs in schools. See how they cope with getting to rehearsals when all the wheelchair taxis are in use. Laugh as they explore Jung's insight that sentimentality is the superstructure erected upon brutality. Three artists from Christchurch’s A Different Light Theatre Trust have been invited to perform at the international conference of the Society for Disabilities Studies in San Jose next year. Artistic director Tony McCaffrey said the conference will be attended by a mixture of academics, performers and activists, “so it is really good networking and a chance to see what is going on in the world of disability culture”. The trip to the United States is being supported by a grant from the Christchurch Polytechnic Institute of Technology (CPIT) Foundation. Experimental performanceA Different Light was set up six years ago as an experimental performance company, but “the mixed ability side of things has kind of taken over”. The group’s latest production, The Wizard of Oz, was the third in a row featuring only performers with some form of disability. “After opening night we were all commenting on how the focus of the performers has grown so much, the devising and ownership of the material has developed hugely, and the sense within the group that if things in the performance don’t go quite as planned, they have the ability to cope. “That’s quite a high level of processing, of holistic involvement,” said Tony. Staged as part of CPIT’s Ignition Festival in November, The Wizard of Oz was about the performers’ response to the original film and its characters. The cast made innovative use of technology, including an iPhone application called Auto Tune that enabled a performer with cerebral palsy to project his ‘voice’ over a background beat. Tony, an acting and voice tutor at CPIT, is excited by the potential offered by technology, for example to performers with disorders on the autistic spectrum. He is planning a paper next year on assistive technologies. He is lobbying for “meaningful involvement” of people with disabilities within the faculty of creative industries. The Different Light Theatre Company will live up to its name with performers casting a different light on the classic Wizard of Oz narrative during this month’s UC arts festival Platform. The mixed ability theatre group will be presenting a double bill of performance. In the first half of the evening they will perform The Poor Dears, a re-working of a show that premiered at the 2009 Body Festival. This will be followed by scenes from a work in progress – the company’s particular spin on The Wizard of Oz. Director Tony McCaffrey, currently studying towards his PhD in the Theatre and Film Studies Department of University of Canterbury, started Different Light Theatre Company six years ago. In the early days of the group, students and other “abled” performers took to the stage along with disabled performers but in the company’s last two productions – Frankenstein’s Children and The Poor Dears – the entire cast has been comprised of performers categorized as disabled who have been active in collaborating on the script and incorporating something of their experience into the performance. In The Poor Dears, the concept of the identity of the performers is explored through performance. “The title [The Poor Dears] came from one of the company’s members who didn’t like being a called ‘a poor dear’ – a term that is often patronising and infantilising,” Mr McCaffrey said. From that phrase the group devised a performance about a group of intellectually disabled performers who travel overseas and arrive at an airport in the United States where they are subjected to processing by US Border Patrol. Mr McCaffrey said the interest of a number of members of the company in the film The Wizard of Oz had led to the 1939 film being used as the inspiration behind their latest production. “In its own weird way it deals with issues of disability – there’s the character who doesn’t have a heart, one without a brain and the grotesquery of the presentation of the small people, the munchkins. Then there’s the whole notion of what’s over the rainbow and we’re taking a very different view of that,” he said. The company had just come back from another sort of “Oz”, namely Australia, where Mr McCaffrey and eight performers presented at the Arts Activated Conference at the Powerhouse Museum in Sydney. Mr McCaffrey said elements of the group’s trip to Oz would also colour their upcoming performance. Later this year, Mr McCaffrey will present aspects of his PhD research on the politics and aesthetics of disability performance at the Society for Disability Studies annual conference at Temple University, Philadelphia and at the Performance Studies International Conference in Toronto. Tony McCaffrey's enthusiasm is infectious. There is a passion and vitality evident when he talks about his work. 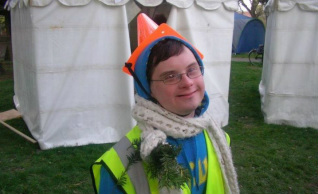 You can't help but join in and feel excited about his world of mixed ability theatre performance. 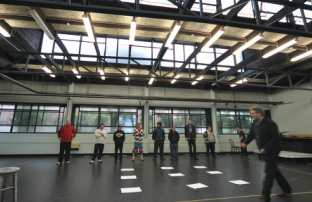 AT CPIT Tony teaches students about theatre history and theory and directs performance, drawing on his extensive international theatre background. An interest in mixed ability performance stems from running theatre workshops for disabled people for the Chirstchurch City Council some years ago. Inspired by their tremendous energy to learn and perform, Tony took his participants on to the stage.A Different Light Theatre Company was formed about 4 years ago, initially out there with cutting edge productions. Tony introduced disabled performers into the group to create theatre with people of mixed ability and has taken shows around NZ and to Australia. NASDA students are often invited into the group, and are generally keen to be involved, even though this can provoke challenges for them. Tony's research interests follow his passion, and he has a recent PhD proposal accepted on the politics and aesthetics of disability performance. The Company's latest production, Frankenstein's Children, was a first. All were performers with disabilities. This raised new challenges for Tony. Would the group take ownership of the text, would they understand the content and irony, would there be rhythm in a scene, what about the cueing? The story is about a group of scientists creating the perfect human being through genetic modification, with historical glimpses of how those with disabilities have been treated in the past. The gamble paid off and the show was a great success! While Tony believes the performers grew from being without the abled bodies, he now wants to explore whether this is the best process for those who have learning difficulties. Tony has a vision for a mixed ability performance programme at CPIT, incorporating areas such as theatre, broadcast and dance. He wants to allow access for voices that don't normally get heard. And to witness more memorable moments where all performers, regardless of ability, will describe their occupation as "actor"!